A 22-member Indian team of wrestlers has embarked on a trip to Budapest, Hungary to compete at the 2013 World Wrestling Championships which begin today. Many of them will be aiming for podium finishes as they get set to take on the best from around the world. After the spirited performance at last year’s London Olympics, where India bagged two medals, there is much optimism in the camp. Also, the news that the sport has made a re-entry for the 2020 Olympics has served as a shot in the arm as the wrestlers will be keen to make a mark. There are three categories and each of the events will take place in a sequential order. It starts off with the men’s freestyle competition (September 16-18) followed by the women’s freestyle (September 18-20) and finally the Greco-Roman (September 20-22) at the Papp Laszlo Sports Arena in Budapest. So far, India has managed to win only one gold medal at the Worlds and it was won by none other than India’s two-time Olympic medallist Sushil Kumar. He had won the 66kg freestyle category back in 2010. In the 2011 edition, India had drawn a blank. Sushil has been out of action for a year now and has not competed ever since the final at the Olympics last year due to a shoulder injury. But, the injury has now completely healed, and he is back to lead the Indian contingent on its quest for glory at the World Championships. Youngster Arun Kumar has been named as stand-by for Sushil in the 22-member team. Arun is a gold medal winner from the Junior Asian Wrestling Championships at Jakarta in 2011. Yogeshwar Dutt though, winner of a bronze medal at the Olympics last year, will not be competing as he is yet to recover from a knee injury. But he will be there with the team to cheer them on from the sidelines. India have a total of 7 medals until now at the Championships – one gold, one silver and five bronze. 20-year old Amit Kumar, who is the Asian champion, will kick-start India’s campaign when he competes in the the 55kg event. Arun (66kg) and junior world bronze medal winner Satyawart Kadian (96kg) are the others in action today in Budapest. In the female division held last year, Geeta Phogat and Babita Kumari had each won a bronze medal at Edmonton, Canada. 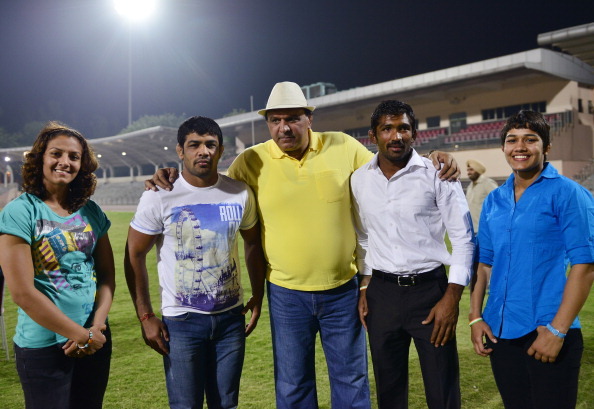 Like Sushil in the men’s, Geeta will be spearheading the Indian women’s challenge at the marquee event. Freestyle: Amit Kumar (55kg), Bajrang (60kg), Arun Kumar/Sushil Kumar (66kg), Narsingh Pancham Yadav (74kg), Pawan Kumar (84kg), Satyawart Kadian (96kg) and Hitender (120kg). Greco Roman: Gaurav Sharma (55kg), Ravinder Singh (60kg), Sandeep Tulsi Yadav (66kg), Rajbir Chhikara (74kg), Harpreet Singh (84kg), Hardeep (96kg) and Naveen (120kg). Female: Nirmala Devi (48kg), Vinesh (51kg), Pooja Dhanda (55kg), Geeta Phogat (59kg), Geetika Jakhar (63kg), Navjot Kaur (67kg) and Jyoti (72kg).